As 2010 transitions into 2011, an update on the Hope Rally is appropriate. For a more in-depth discussion of the Hope Rally, please see Hope Rally Update (12/3/10). 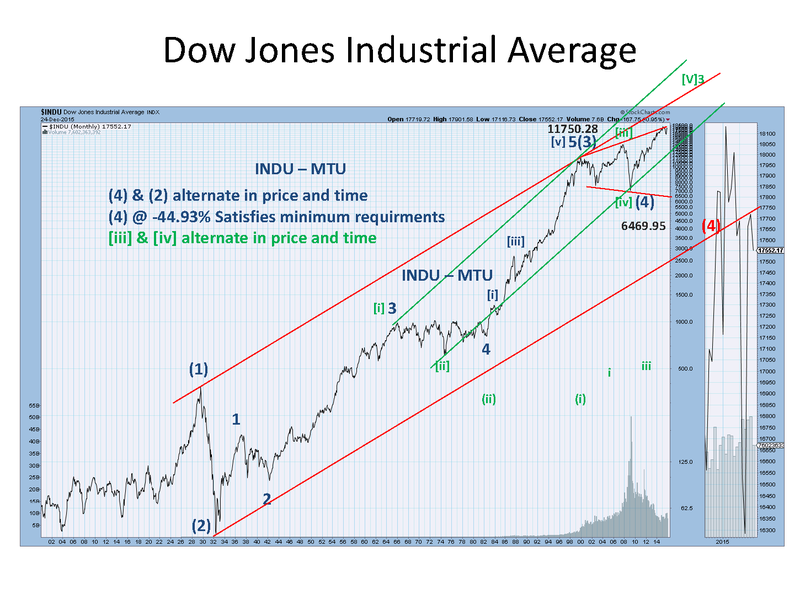 Chart 1 updates the top four scenarios (wave counts) that describes the stock market trajectory and projections into 2011. Here's a summary of these scenarios and the associated (subjective) probabilities. 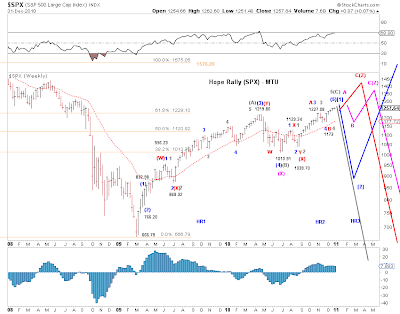 [Blue - long term bullish] Based on this count, the end of the current advance, likely in early 2011, is the end of primary wave -up of a new multi-year bull market. 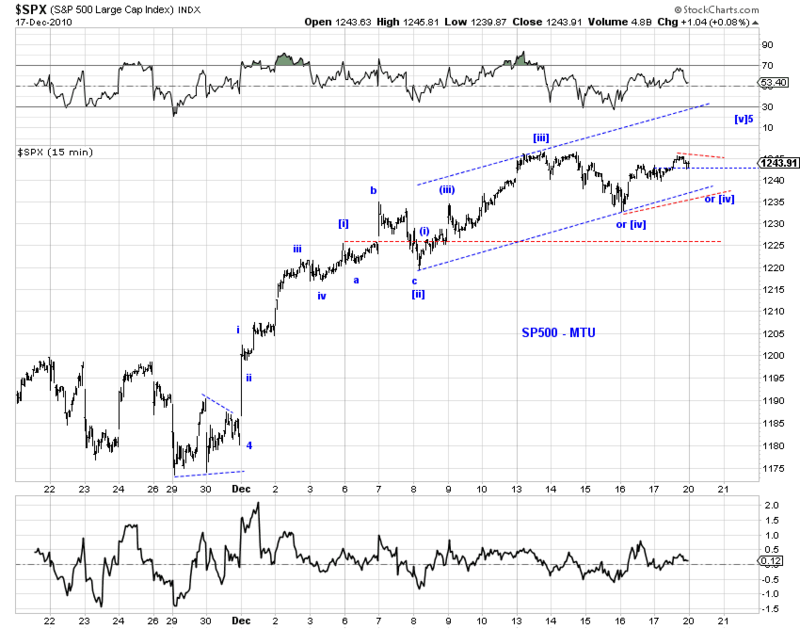 A deep wave -down correction is likely. 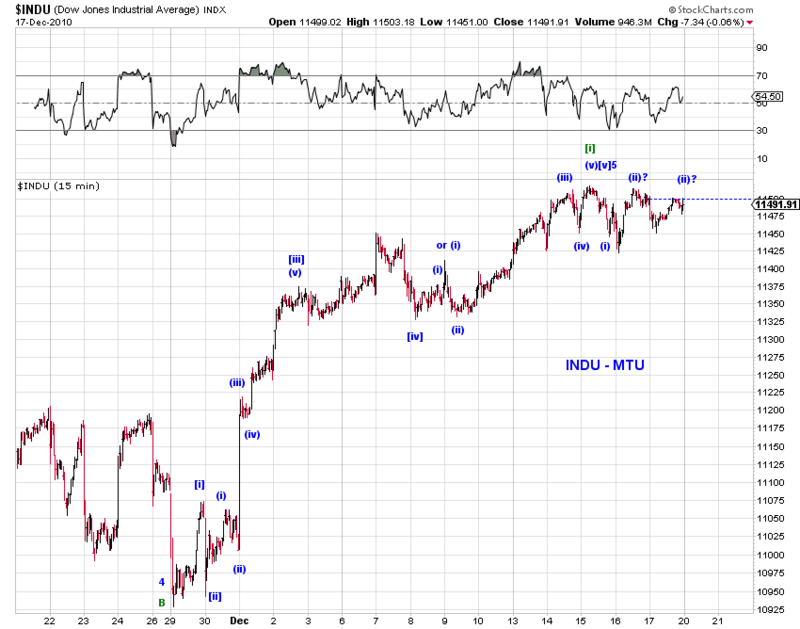 The subsequent wave -up advance will push the market to new highs. 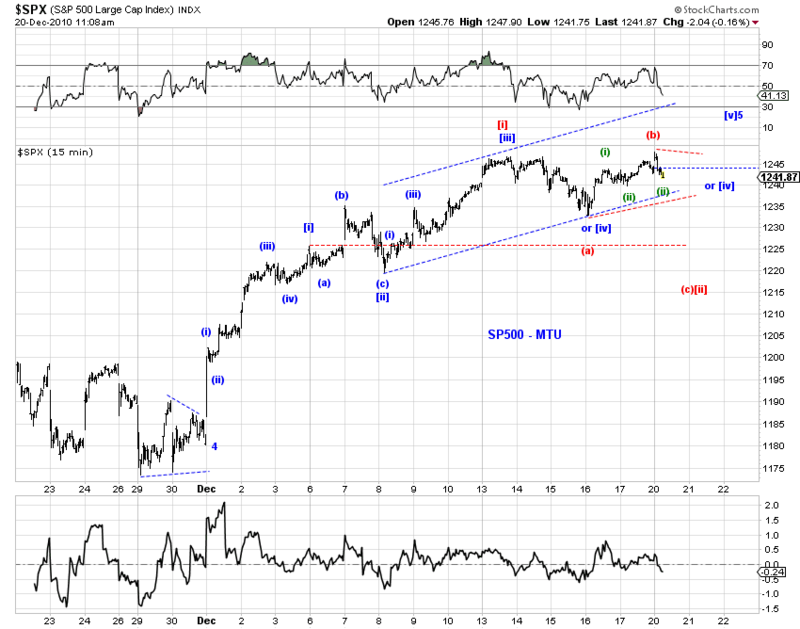 Targets for the top is around current levels or around 1290 in SPX. 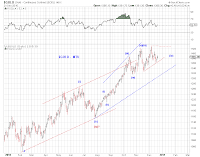 [Red and Pink - long term bearish] Based on this count, the Hope Rally has additional upside potential in price as well in time. A near term pullback is likely. The difference between the two scenarios is whether the proposed near term pullback is (very) shallow (Red) or meaningful (Pink), as illustrated in Chart 1. 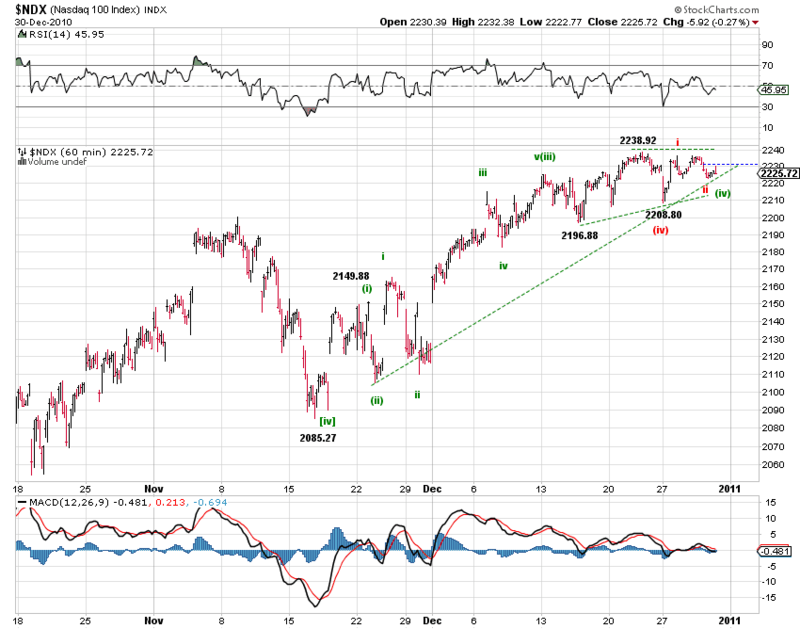 Targets for the top is around 1350. [Gray - long term bearish] Based on this count, the end of the current advance, likely in early 2011, is the end of the rebound. The bear market that resumes will likely push the market to below the 2008-2009 low. 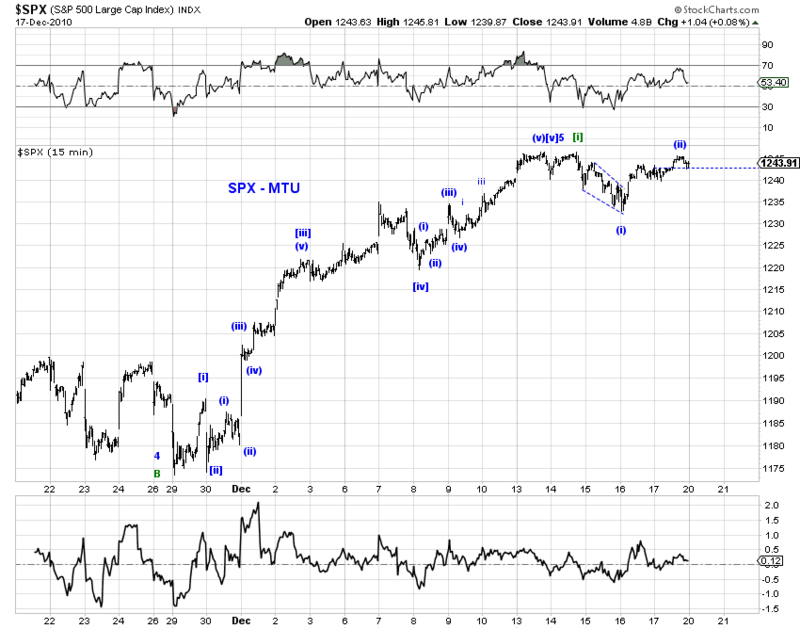 [Other - long term range-bound] Another possibility is a drawn-out side-ways market with a relatively large range. The long term bearish counts, collectively, are moderate more likely than the long term bullish count (gray) outlined above. Between the bearish red and pink counts, the pink count is moderately more likely than the red count. Lower low today eliminates the immediately bullish count, leaving several near term options, with an incomplete upward correction (red) the most promising count at the moment. 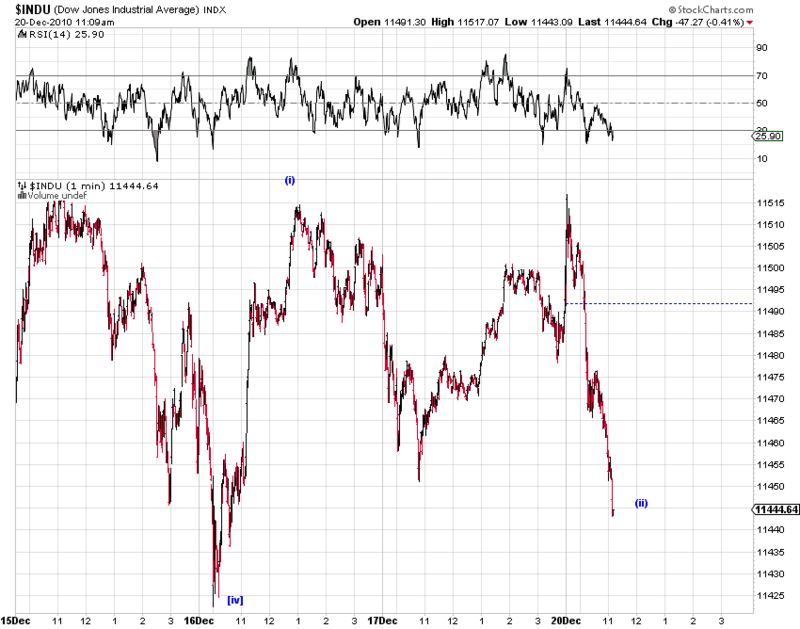 The decline from the recent high so far is a zig-expanded flat-zag unless it accelerates down from here. 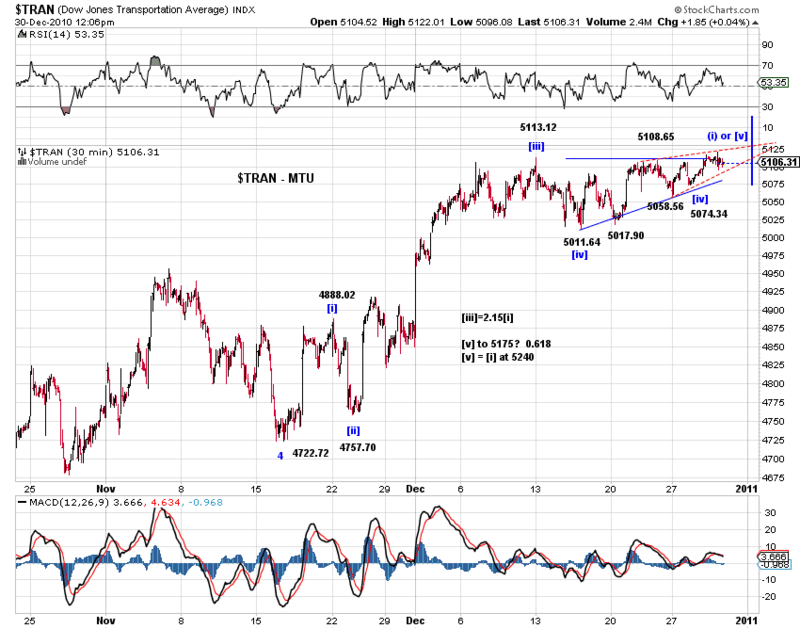 [EOD] There's no change in the proposed count on the ES and $TRAN - see the 1210pm update below. 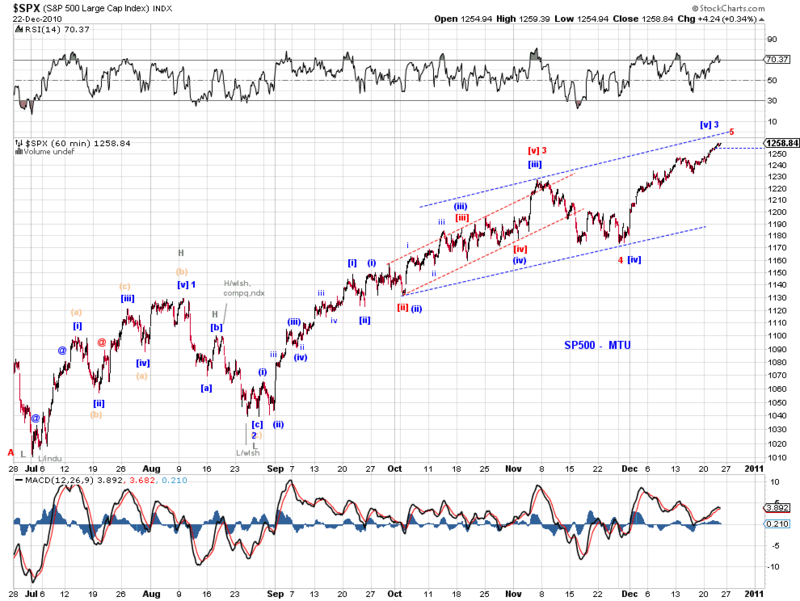 Here's a count on $NDX which is in a similar position. So the primary count is that there's one more January rally to come. Primary counts are the black count in ES and the red count in $TRAN. The alternative counts shown are appealing but lack confirmation. 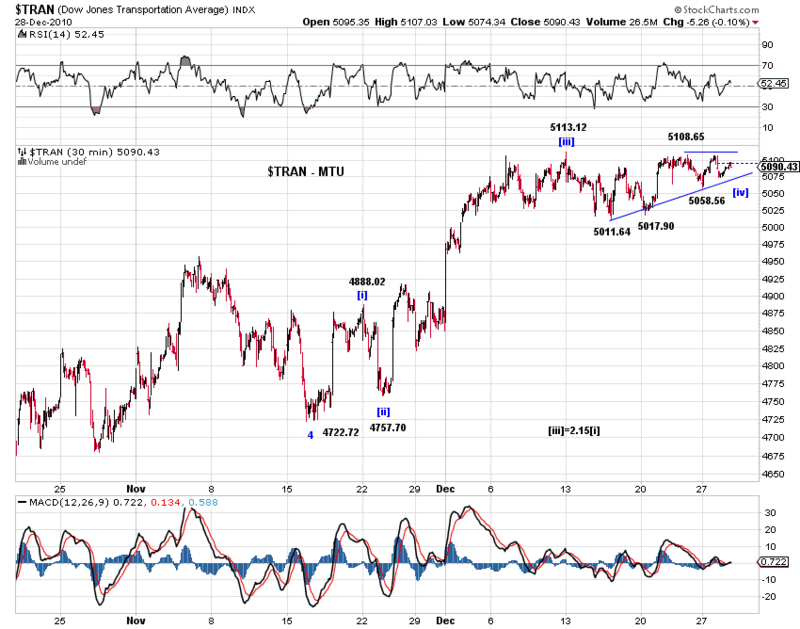 A relatively more discernible wave structure in $TRAN. In SP500, the Dec 26-27 overnight low in ES is likely a key level. 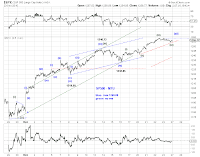 The new high overnight eliminates the less likely bearish red count, leaving the competing black and green counts depending on where one marks the end of minor wave 4. 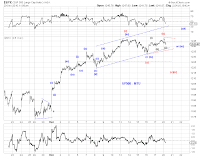 [EOD] There is no change regarding the wave structure outlined in the overnight update. Using ES, the primary count (black) is that wave (v) of [iii] of 5 started at this morning's low. The second most likely count (green) is that wave [iv] of 5 is likely still in progress. 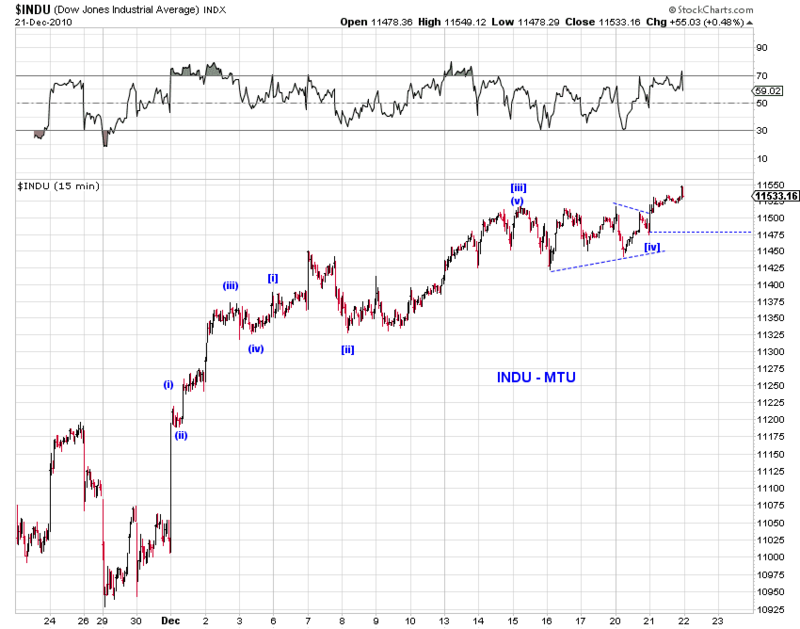 Since the Dow made a lower low late November, it may be preferable to mark the end of minor wave 4 there. 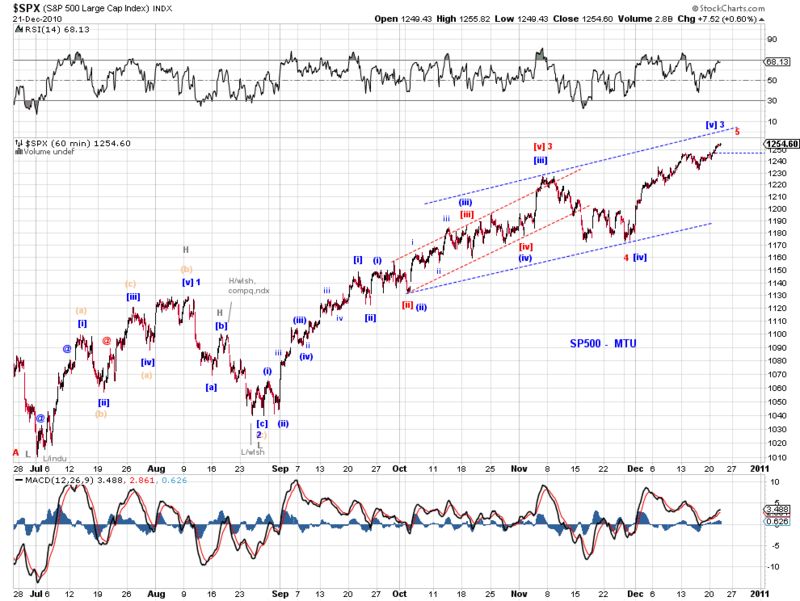 Thus, this count (which assumes minor wave 4 ended much earlier in SPX than it did in the Dow) is less appealing, but valid for SPX nevertheless. The less likely count (red) is that the top is in. Note that the red count is technically valid too. 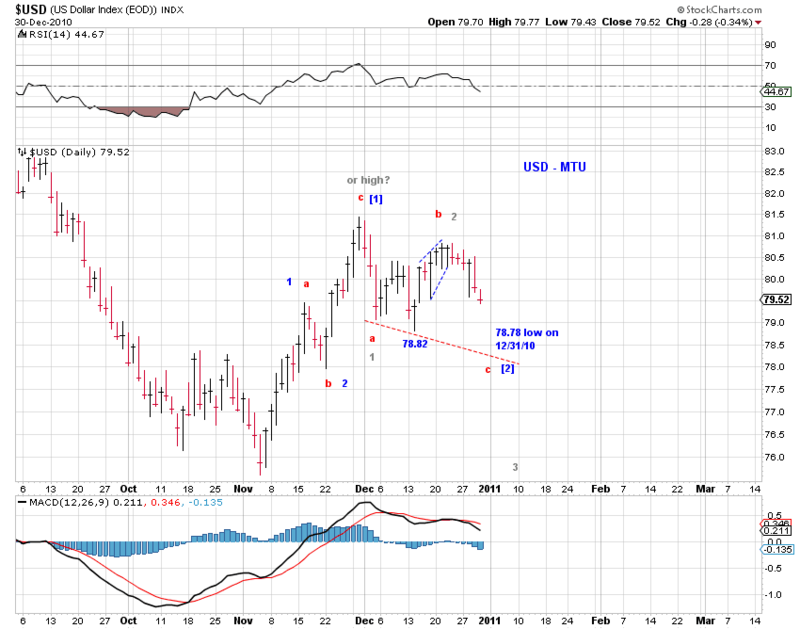 Primary count is that this pullback is a small degree 4th wave. The more bearish alternative count is shown in red and green. Multi-Asset Outlook (12/10/10) gives a summary assessment of a number of markets priced in USD based on each market’s own wave structure. 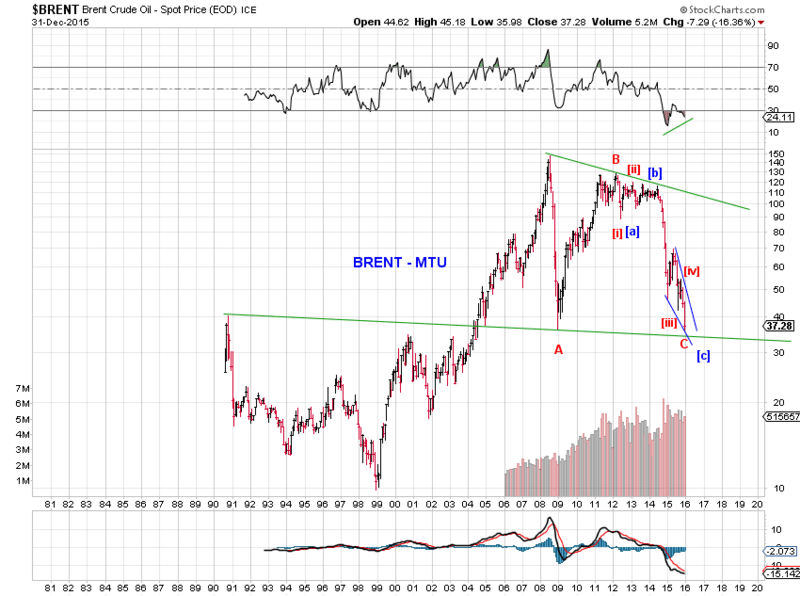 The week’s analysis offers a perspective on relative performance in 2011. 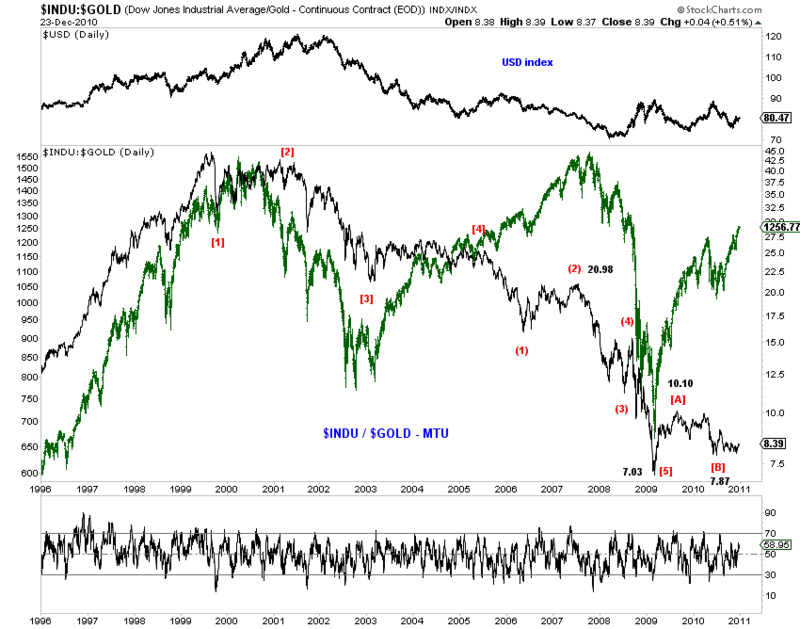 A key dynamic that allows us to make interesting inferences is gold priced in stocks. 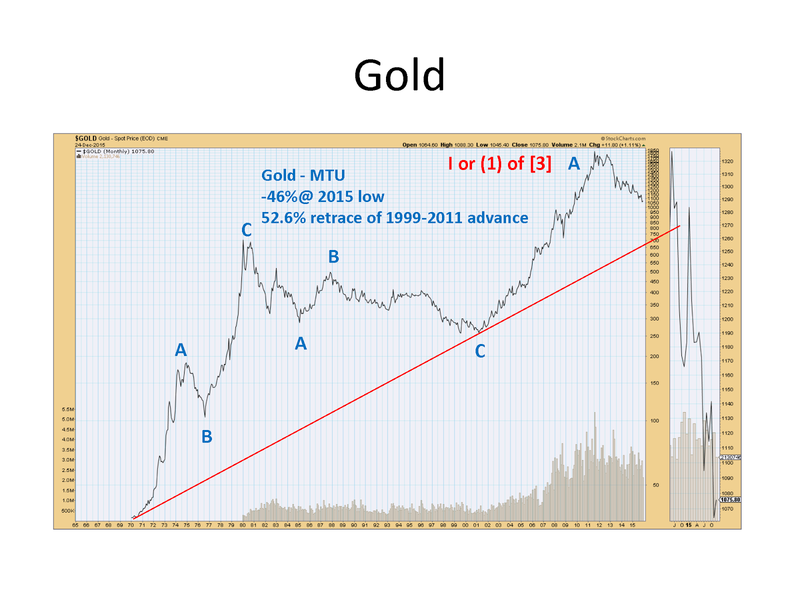 Chart 1 shows a 15-year history of the ratio of Dow to Gold. 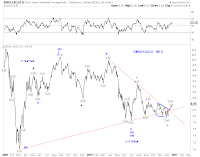 From a EWP perspective, a decade-long five wave decline in the INDU/GOLD ratio ended at its 2009 low of 7.03. 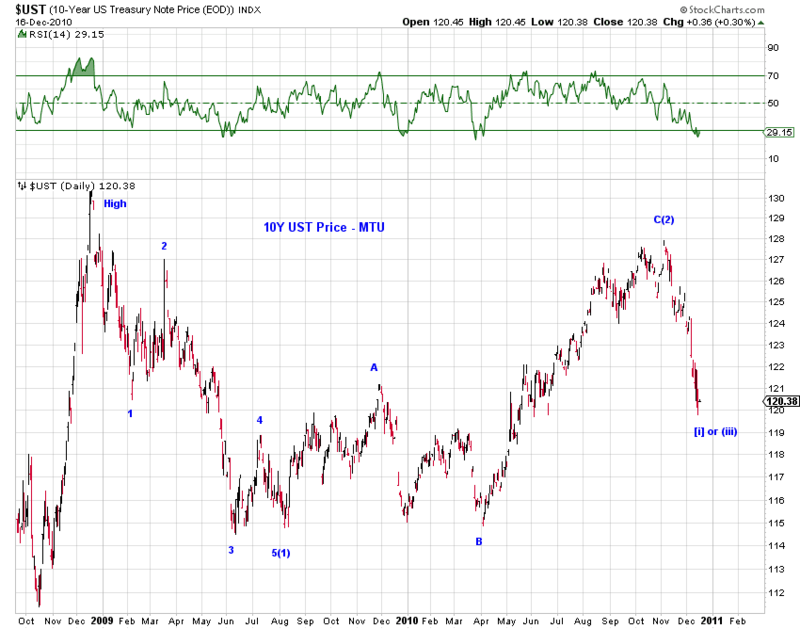 A multi-year rebound has been in progress since then, with a likely target around 15 to 20. 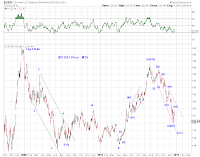 Regarding the wave structure of the proposed rebound, we now have enough waves in place to venture an educated guess – a regular upward flat or a double zigzag for the initial rebound. 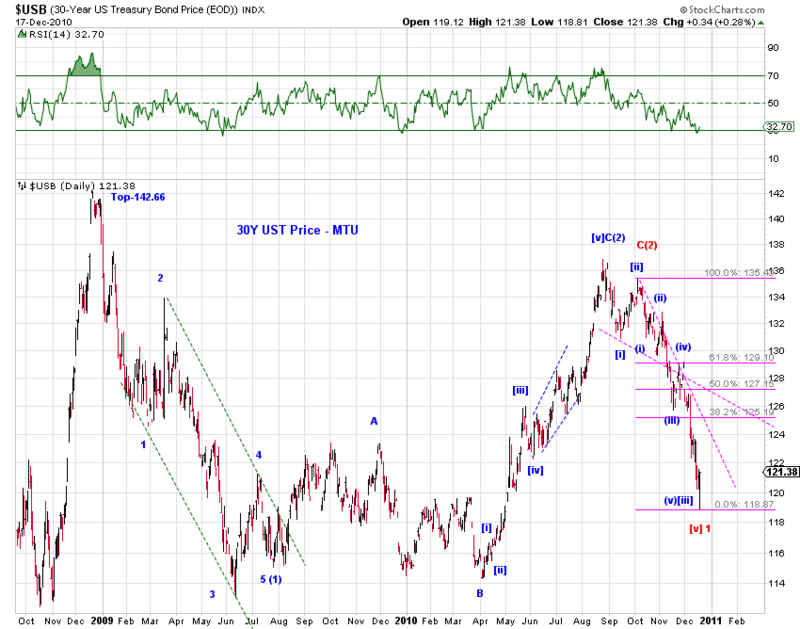 There have already been some nice fib relationships since the 2009 low (Chart 2). C of (A) is around 0.618 of A of (A), C of (B) is 1.382 of A of (B) and (B)-down is 0.726 of (A)-up. 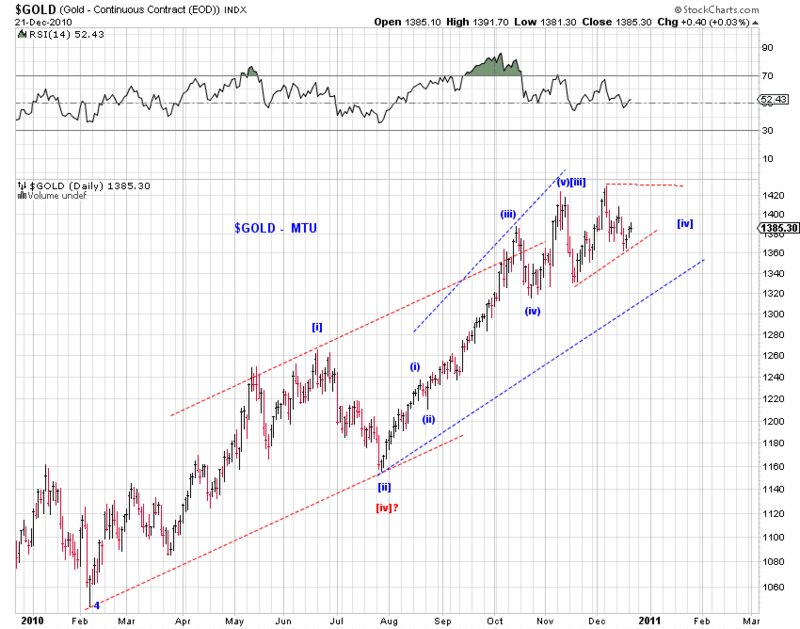 If the larger wave count is correct, stocks are likely to outperform gold meaningfully in 2011, with the dollar and bonds being directional (see below). 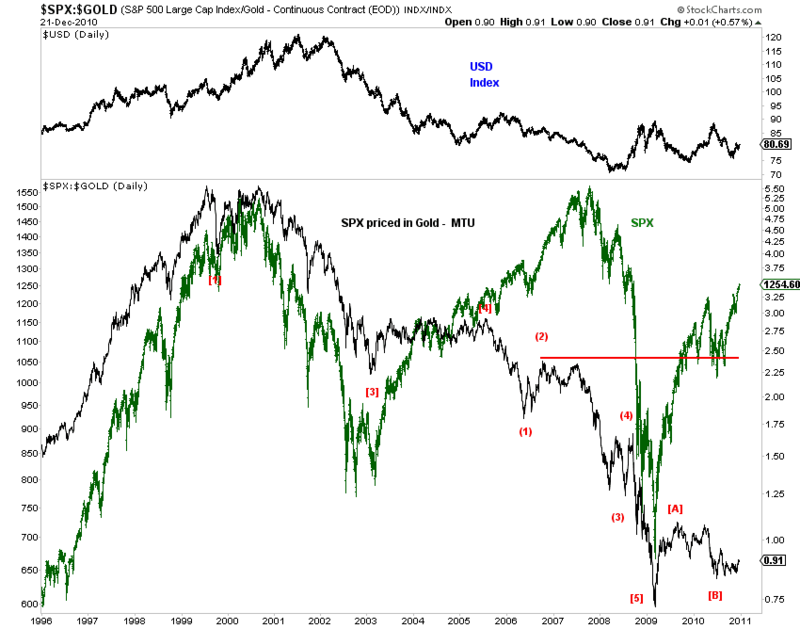 In a reflationary/inflationary bull market, stocks could turn out to be a better hedge than gold. 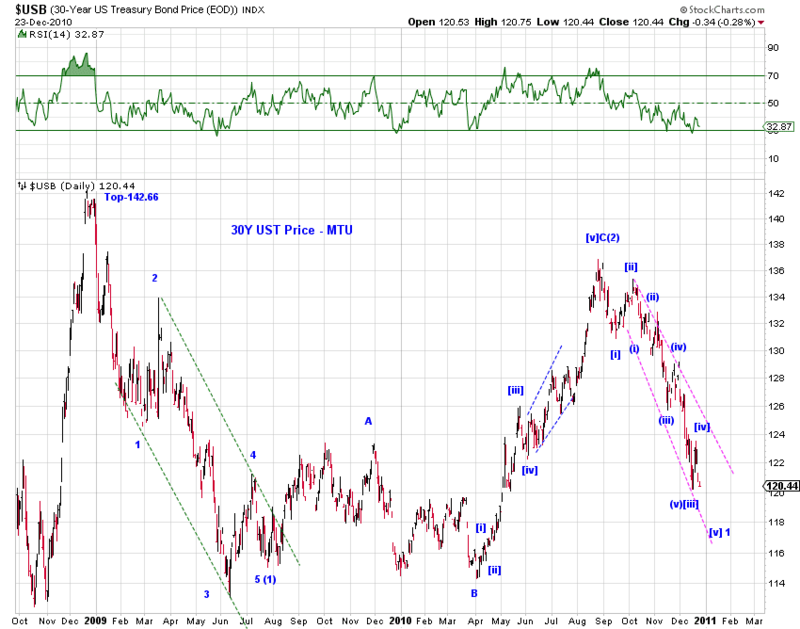 The dollar is likely to underperform both stocks and gold. 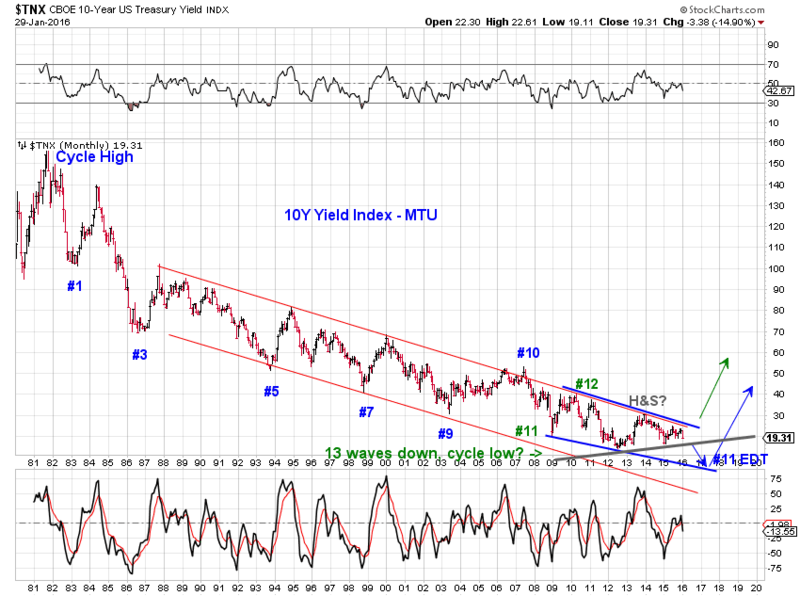 In addition, the young bear market in bonds likely continues. 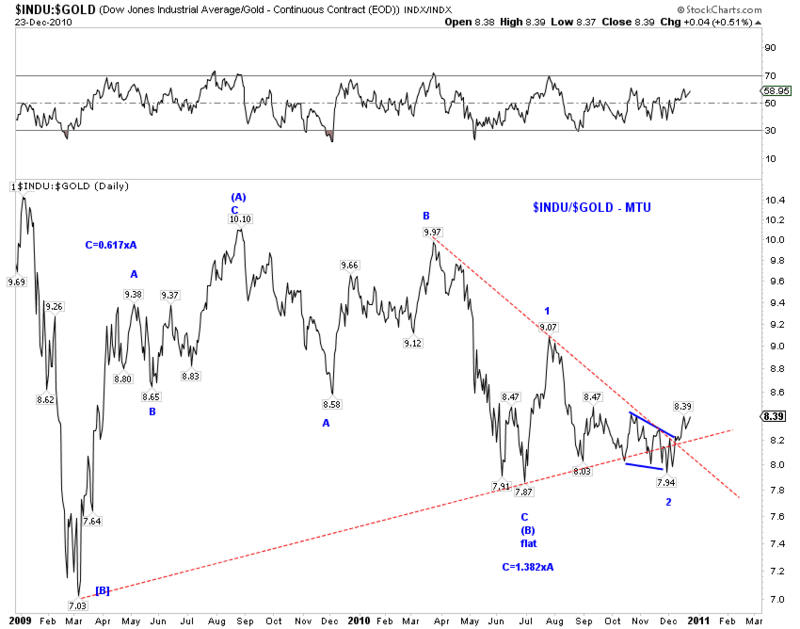 In a deflationary bear market, gold could fall faster than stocks. 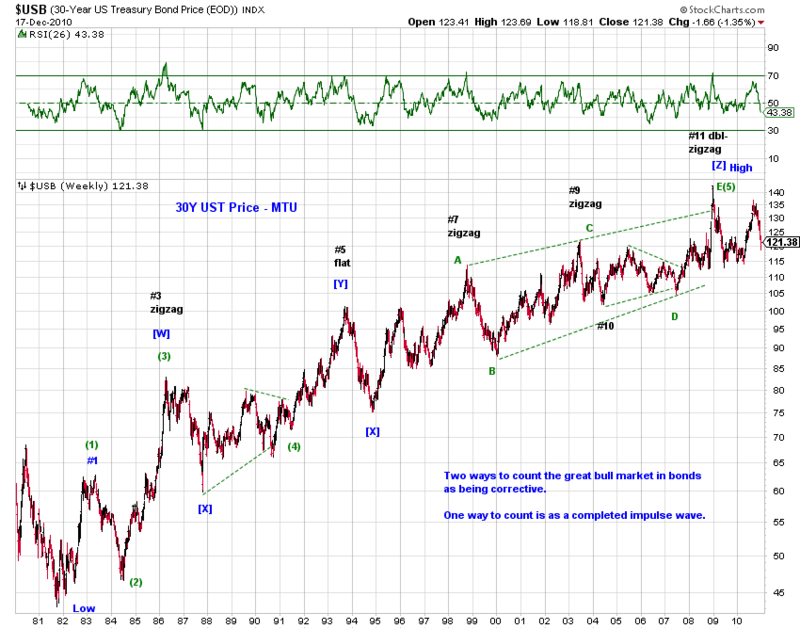 The major beneficiary is likely the dollar, outperforming both stocks and gold. 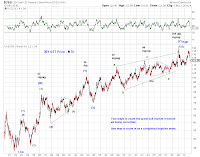 Bonds are likely to rally, at least initially in the form of a wave 2 of (3) retrace even if the assessment that a multi-decade bear market in bonds already being in progress is correct (see The Bond Mania (8/20/10)). 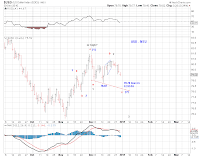 Obviously, the bearish count sees the pending top as the end of minor wave 5 since the July low, and probably the end of Hope Rally altogether. 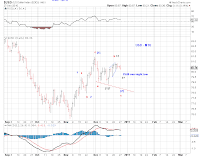 Now "a" bullish count, as inspired by SPX priced in Gold (Chart 1), SPX squiggles (Chart 2) , and Gold's wave structure (Chart 3) . 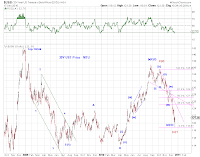 Thus, on the bullish side, one possible scenario is that the near term peak in SPX is only minute wave [iii] since the November low, with [iv]-down and [v]-up to come - keeping the SPX/Gold ratio up. This is indicated by the blue count in Chart 2. The caveat is that this count does not have the best form. 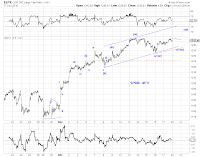 (The other possibility is some kind of extended wave 5 or wave [v]). 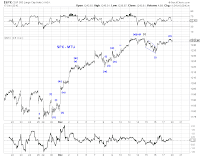 In addition, Gold either tops before stocks or at the same time as stocks but falls much faster than stocks - both are reasonable scenarios - continue to feed the advance in the SPX/Gold ratio. 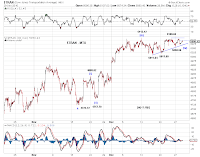 [EOD] INDU appears to have broken out of a triangle and SPX appears to be forming a potential ending diagonal triangle, both terminal patterns at least for this segment of the advance (Chart 1 and Chart 2) . 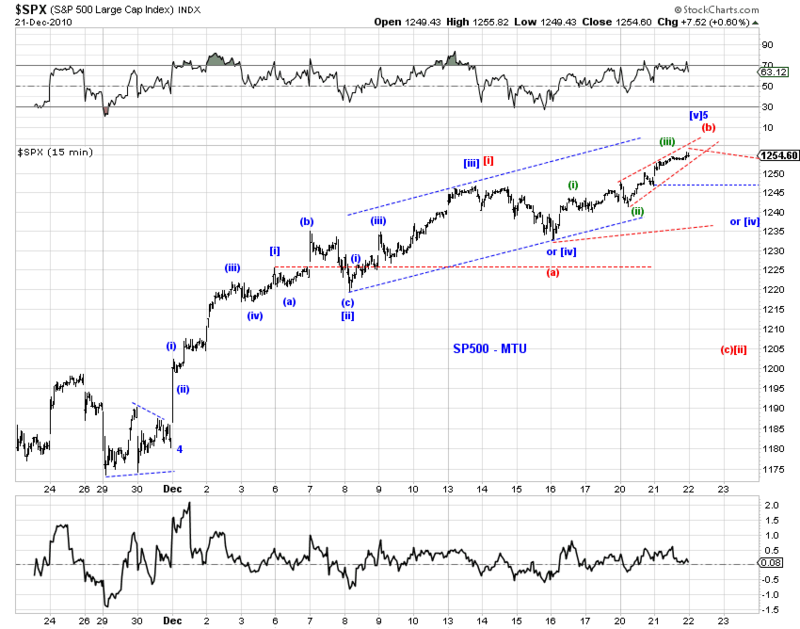 The move is likely at its final stages if not already over - see the black and red counts in the YM chart 3. Chart 4 shows the EDT in ES. 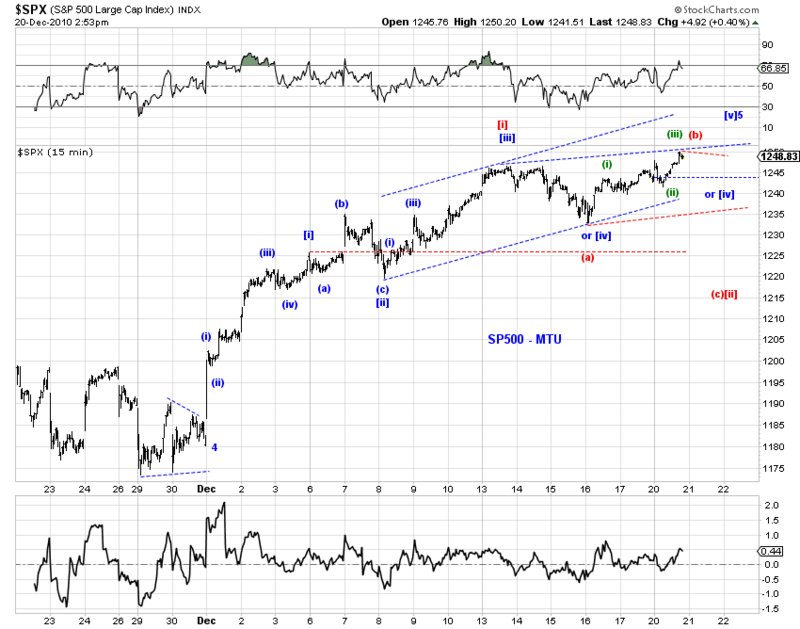 As stated yesterday, if these counts are correct, maximum potential is 1257.25/.75 in ES for this wave. 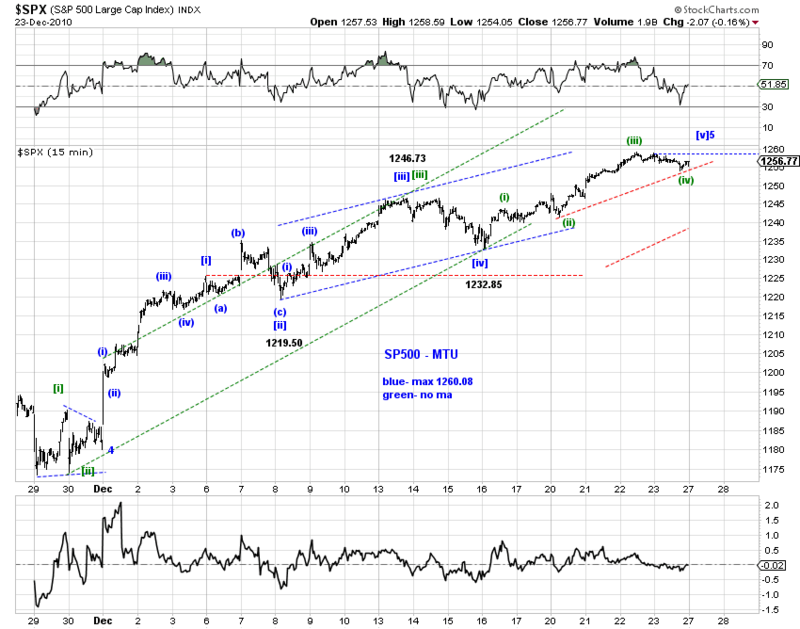 [EOD] no change in the general count highlighted in the [255pm] update. Could be rushing the green count a bit, but here's the general profile. 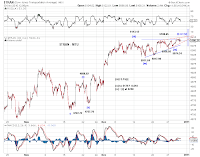 On the ES, the black and green counts are now aligned, maximum potential is 1257.25/.75 based on these counts and assuming no extended wave (iii) / [iii]. In addition, the counts on the ES and YM are now identical. 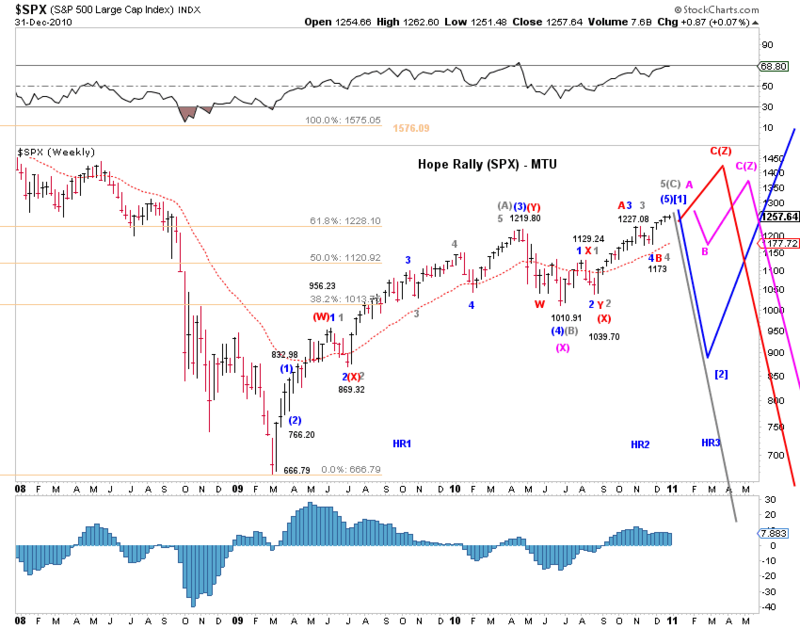 Hope Rally Ends Here (Dec. 2010 attempt)(12/15/10) highlighted one of the logical point/area for a top given its assumptions. 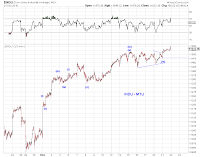 Remarkably, the proposed top in the Dow, the proposed orthodox top in Wilshire 5000 and the nominal high in SP500 have so far remained intact. It should be noted that the proposed orthodox high in SP500 did not survive the call and Nasdaq indexes have managed another nominal high. 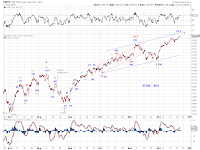 Assuming Nasdaq indexes is diverging from the broader indexes as they have done in the past, in hindsight, we may just have to slightly adjust the proposed squiggle count of SP500 and leave the proposed squiggle count of the Dow alone to maintain the call for a top. See Chart 1 and Chart 2. 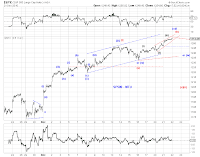 At the same time, given the lack of an obvious impulsive decline so far and the fresh highs in the Nasdaq indexes, we must be mindful of the additional possibilities (i.e. the other logical areas for a top). 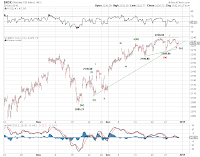 Assuming no further extension and that we are indeed dealing with minor wave 5 since the July low, the other logical spot for a high/top should be below 1261 in SP500 and more likely in the 1250 area (Chart 3). 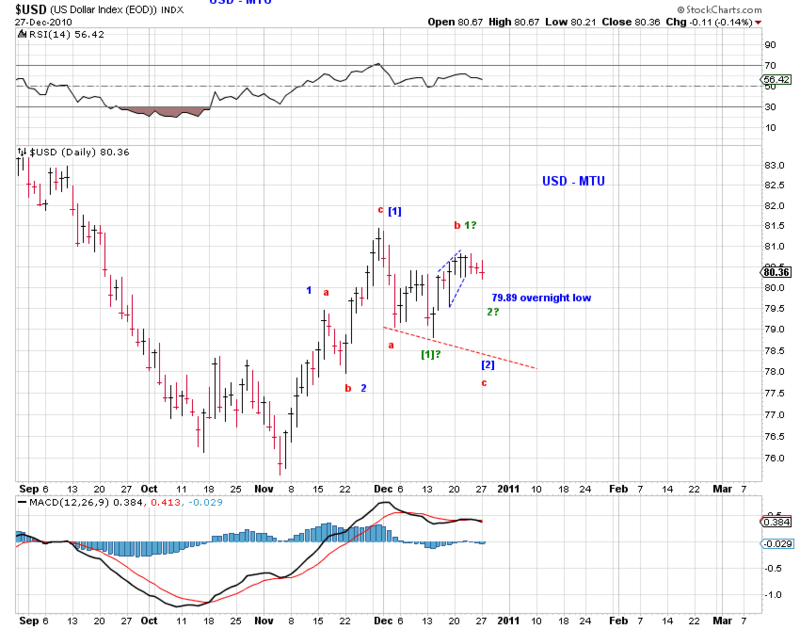 This count has a slightly different starting point for minor wave 5 and marks the recent nominal high as minute wave [iii] of minor wave 5. 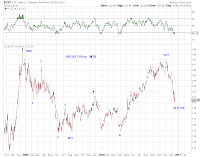 Note that minute wave [iii] is shorter than minute wave [i] in Chart 3, thus limiting the upside potential of minute wave [v] if minor wave 5 and thus the upside potential of the top. 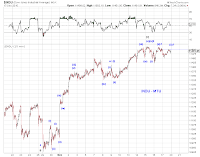 The same count in Chart 3 also maps into the Dow well. 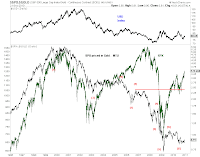 The bear market in bonds (which most likely had started in late 2008) has most likely and apparently resumed since the official QE2 announcement in 10-year notes and a bit earlier in 30-year bonds. 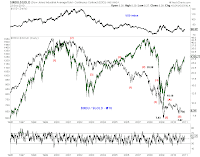 Current counts mark the recent high in yields and low in prices as either the end of the third wave of an initial five wave decline in bond prices or the end of the entire initial five wave decline in bond prices (see Chart 4 to Chart 7). 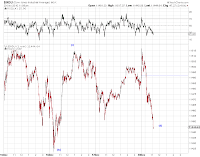 The difference is the amount of retracement before further sell-offs.